YouTube seo is surely needed for every business as being one of the most visited sites on the internet, YouTube gives the businesses ample opportunity to reach targeted masses that can lead to brand recognition, brand popularity, leads and lots of referral traffic. 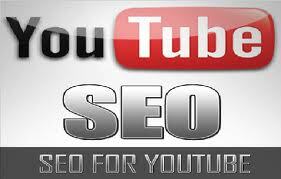 YouTube is a popular video sharing website where you can upload and share your favourite videos for free. You just need a Gmail account to do that. With more than 1 billion unique visitors visiting this immensely popular video sharing site, it is important to market your services by owning a channel and promoting videos. Same as we begin doing seo for any website, we will start with keyword research. You can use the Google Keyword Planner tool to find keywords that are closely related to the contents of your video, keeping in mind the global/local searches the keyword receives. Along with this, make sure to include keywords that are often closely associated with your brand or are locally relevant. Use a keyword rich file name while naming your video. Suppose you are uploading a video related to famous dancers of hollywood then the file name should be "famous dancers of hollywood". Add relevant and keyword friendly title and description tags. Include an URL back to your main website from the description area. This will help in sending referral traffic to the site. In the tags area, fill in 7-8 highly relevant keywords which you think will match the search criteria of the user. Include your main keywords and brand related terms in this area. Make sure to include only those terms that are highly relevant with your video. You must include scripts and transcriptions in order to make the search engines identify the contents of the video. YouTube does a tremendous job in identifying closed captions from the uploaded script itself, so you need to turn on the closed caption area. This will help in proper optimization of your YouTube video and help the alogrithms to closely associate your video content with keywords, sending traffic. After you have successfully uploaded your video, keeping in mind the above optimization techniques; it's time to increase the number of views. You should share the video on all of your social media networks and embed it across your blogs in order to increase the hits. The more views, the better visibility your shared video will receive. The first 24 hours after the video upload is extremely crucial. Try and achieve maximum hits within this time period as it will decide the visibility of your video across the YouTube platform based on the relevancy. Enable the comment section of your video and keep on moderating them. Clear, relevant and productive comments will increase the score of your video. Google has finally replaced its traditional and immensely popular keyword tool with the new keyword planner tool. Google says it has combined the power of keyword tool along with traffic estimator in this new tool. Now, if you want to engage in keyword research activities, then you need to sign in to your Adwords account. 1- You will get to see only exact match statistics. 2- You cannot target specific mobile devices with this tool. 3- No global and local monthly search volume columns. Instead you will see only average monthly searches. 4- No local search trends. You can see the average monthly searches segmented by month when you download historical stats. 5- The columns 'search share' and 'extracted from webpage' has retired. How to Calculate Keyword Effectiveness Index? Link Neighbourhood - Is Your Site Having a Good Link Profile? The web is the home for hundreds of thousands of sites and almost all of them link to other websites making this bond of links a global web phenomenon. It is due to this massive interlinking of sites that Google takes into consideration the backlink profile of your website while examining the relevancy and popularity with respect to any search query. It is only after thorough analysis of backlinks, does Google ranks it in the search engine result page. The more solid link profile, the better is your site image and eventually your site qualifies for better search engine visibility. These are all those sites that provides a link back to your site in the form of text, image etc. These are all those sites to which you are linking to from your own web property. A reputed and high authority site must receive link from authority sites and link back to authority sites. This is a metric that determines your link neighbourhood and helps to judge the overall quality of the website. Consider the example of Wikipedia. It has a diversified link profile where thousands of sites use it as a reference site eventually linking it back as the main source. In the same scenario, there are hundreds of thousands of sites to which Wikipedia provides a link back (we must note here that all the links are no follow). Each and every link present on Wikipedia is verified by an editor which helps to keep this site in good neighbourhood. 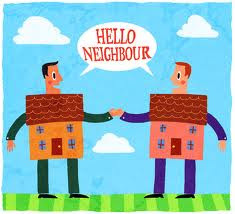 A good link neighbourhood is highly rewarded by Google and other search engines. If your link company rests in spam then it is more likely that search engines will consider your site as spam too and devalue your site authority without which the site performance in terms of getting organic traffic to the site declines. 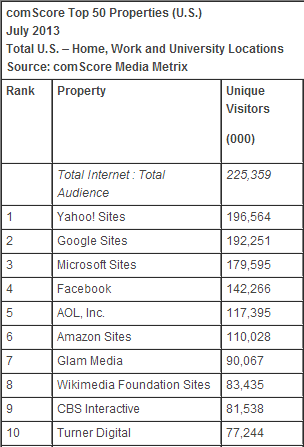 The top US web properties report was published by comScore on August 21, 2013. Microsoft was at the third place while Facebook was at the fourth position. The fifth place was occupied by AOL. Twitter was at the 30th position while Pinterest made it to top 50 by staying at the 49th position. In order to track the success of your business advertising campaign through any channels of marketing, it is important to track specific goals and measure the different actions. Goals in its simplest sense lets you measure those important actions. Log in to your analytics account and click on the website for which you want to track the goals. Now click on Admin. Then, click on goals located under the profile section. Now, click on "Create a Goal". We come to the three step process of creating goals namely goal set up, goal description and goal details. 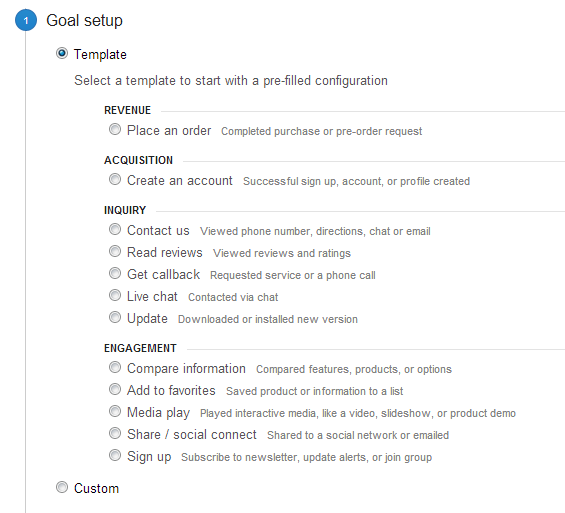 Select a goal template with pre filled configuration. You have 5 choices, namely, Revenue, Acquisition, Inquiry, Engagement and Custom settings. Destination - Choose destination when the visitors need to reach a particular location. Ex- a thankyou page after completing an order. Duration - Choose duration when you want your visitors to spend a minimum amount of time on the site. Ex- 5 minutes spent on the site. Pages/Screen per visit - Choose pages/screen per visit when you need to track how many pages a user loads after visiting the site. Here, every unique visit is counted. Ex- a user loads 10 pages in a visit. Event - Choose event when you want to track some kind of action performed by the user. Ex- clicking on an ad. You can additionally assign a monetary value to the conversion or specify the goal path. But, these are optional. Monetary value will help you determine your profits for every conversion and lets you calculate your total conversion profits easily. 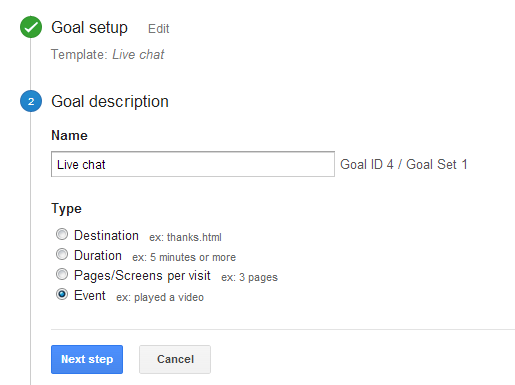 Specifying the goal path helps you identify the path that the users are following in order to reach the thankyou page. This gives you an idea regarding your best performing products. Now, click on create goal and your goal gets created. In order to check how goals are performing, you may check it under the admin tab of your site by clicking on goals. So, now that you have learnt about how to set up goals in Google Analytics, start setting up and experimenting with your own goals. Best Way to Earn a Backlink - Let the Press Cover You! then many smaller media professionals will cover and republish that news earning many backlinks. Now, another big question arises as to "Why will they cover you?". That's right, it is not easy to get yourself covered unless your business produces products and services that are worth covering. But, wait, every one has a chance to solidify their link building process using media coverage. If you are a local business, try and get the local media to cover you. The local bloggers often search for local news in order to write and publish stories in their blog and if your site gets covered in the local news, you have every chance of earning a backlink from local niche bloggers. feature yourself in their story. But, here I must share a piece of advice and that is, never pay anyone to get your story covered; instead earn it. Consult expert link builders and they will advice some solid link building strategy which covers this form of link building. Another abuse of excessive black hat link building has been taken over by Google. Matt Cutts has pointed out that Google does not counts links with anchor text abuse. Links that are editorially provided in the blog post are of much value than links from widgets and infographics that are not editorially provided. In most of the cases, the webmasters don't even know that a link has been put into an embeddable widget with keyword rich anchor text causing link abuse. Webmasters can get really frustrated by the increasing amount of user generated spam. There are several key methods that can help in stopping user generated spam in your site helping it to get recognized by Google as a spam free site; thereby increase the chances of getting better ranked in Google. Comments are a great way to increase effective conversation and build loyal followers. But, in order to stop spammy agents from commenting in your valued site, it is necessary to enable comment moderation. Additionally you may also stop the user from adding hyperlinks in the comments by changing the configuration and removing HTML from it. Captcha is a great way to restrict bot spam. Consider using Google's free reCAPTCHA's service. In order to save your site from the negative action taken by Google, use rel=nofollow tag which stops the hyperlink from getting the precious link juice that is used to calculate PageRank. Another way is to use robots.txt and disallow the folder containing the spam from getting accessed by the search engine bots. Local seo industry is growing big and as more and more local business owners compete with each other for first page rankings in Google, local seo content optimization becomes necessary. This excellent infographic created by smallbuisnesscoach explains the basics of creating a perfectly optimized local page. Google has added a new feature under Webmasters tools that will enable the site owners to check whether their website has been manually penalized by Google or not. This new feature is named "Manual Action Viewer" and can be found under "Search Traffic" tab in Google Webmasters. After logging into your webmasters tools and clicking on Manual action, you may find any of the following messages notifying you about the manual spam action being taken on your site. These messages may be displayed under two sections namely "Site Wide Matches" and "Partial Matches". Site wide matches means that the manual action has been applied on the entire site and partial matches means that the actions have been applied on specific sections or URL's. Reason - Google has detected a pattern of unnatural links pointing to your site. Action to be taken - If possible remove the unnatural links and submit reconsideration request or else no action is required on your part. Action to be taken - Remove the unnatural links and submit reconsideration request. Reason - Google has detected some kind of paid links or outbound links on your site. Action to be taken - Identify unnatural links and remove them from your site. Also submit a reconsideration request after removing the links. Reason - Pages on your site have been hacked by a third party that has resulted in spam. Action to be taken - Review the coding of your site and remove unwanted coding by taking some technical expertise. Thereafter, submit a reconsideration request. Reason - Google has detected low quality pages on your site that has little to no user value. Action to be taken - Identify and rewrite the content of low quality pages. Remove any duplicate content or automatically generated content. Then, submit a reconsideration request. Reason - Your site is using techniques such as cloaking or having automatically generated gibberish content and scraping content. Action to be taken - Remove the unwanted content or coding from your site so that it meets the Google guidelines then submit a reconsideration request. Reason - Your site is having some form of user generated spam like content in forum pages, user profiles etc. Action to be taken - Identify and correct the webmaster violations and submit a reconsideration request. Reason - Your site is showing different content to users than it is showing to the search engine bots. Action to be taken - Identify and remove any form of cloaking. Then submit a reconsideration request. Reason - Your site is using deceptive practices like hidden text and keyword stuffing. Action to be taken - Identify and remove areas on your site that are contributing to keyword stuffing and hidden text. Thereafter submit a reconsideration request. Reason - Significant fraction of pages hosted on a service are spammy. Action to be taken - Remove any form of spam from the site and request consideration. 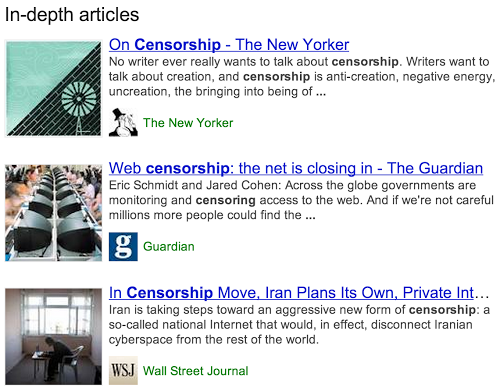 Google Adds New Set of Search Results Labelled "In-depth articles"
Google has added a new set of search results on broader topics labelled as "In-depth articles". This was announced recently by Pandu Naik, member of technical staff, Google. The results returned under in-depth articles will contain "high quality content", as per the guidelines specified by Google. This will be a great sign for search engine optimizers in order to discover and compare the quality of content that Google is treating as the best. Some sites that are known to provide quality content and have already made it into this new set of search results are "Wall Street Journal", "New York Times", "Guardian" etc. The sites that will appear under this new label will be selected by an algorithm. The algorithm will detect which site's content is of high quality with respect to a broader topic and will return the top picked results under the "In-depth articles" label. For a majority of results, this will cover news sites and magazines sites. This new feature will be rolled out in the next few days. Here is a snapshot as to how it will look like? Headline - The headline of the article. Alternative Headline - The alternative headline (a secondary title) of the article. Image - Url of an image of the item. Date Published - Date of the first publication. Article Body - The actual body of the article. It helps to associate the content on the web page with a particular author. This helps the algorithms to detect high author rank authors and also helps them to display author information in the search results. If the web content is divided into many parts then it should be properly divided and paginated. Page canonicalization must be done correctly and the rel=canonical tag should not be declared multiple times on the same web page. In order to help Google display the logo of your website in the search engine results, the logo of your brand must be included as a default image in the official Google Plus page of your brand. Let's move a little back into history and know more about the earlier search engines that existed before Google. This search engine history timeline will enable you to get a good grasp over the old and new search engine technologies. 1963 - Ted Nelson coined the terms "hypertext" and "hypermedia" and launched the first hypertext project "Project Xanadu". 1994-1995 - Gerald Salton is regarded as the "Father of Modern Search Technology". He published various publications related to machine readable texts, theory of indexing, automatic text decomposition, automatic query expansion etc. 1994 - Web Crawler was launched. It was created by Brian Pinkerton. It was the first search engine to provide full text search. Currently it is working as a meta search engine and is owned by Blucora/Infospace. - Lycos was launched by Bob Davis. It provides a fun way to search with information categorized into various subcategories in the home page itself. - Metacrawler was launched by Erik Selberg, Bobby Kalili, and Professor Oren Etzioni. - Infoseek was launched by Steve Kirsch. It has now been acquired by Walt Disney and renamed Go.com. It no longer serves as a search engine. 1995 - Excite was launched. It is an internet portal providing similar services as Yahoo. It was founded by Graham Spencer, Joe Kraus, Mark Van Haren, Ryan McIntyre, Ben Lutch and Martin Reinfried. - Altavista was launched. Currently it is owned by Yahoo but unfortunately Yahoo shut down its operation on July 8th, 2013. 1996 - Hotbot was launched. It is still serving as a search engine and is operated by lycos. - Dogpile was launched. Currently it is working as a meta search engine and is owned by Blucora/Infospace. - AskJeeves was launched by Garrett Gruener and David Warthen. It was later renamed as "Ask.com"
1997 - Google was launched by Larry Page and Sergey Brin. Since its launch, it has constantly remained the number 1 search engine of the world. The success of Google was largely due to its ability to present more relevant and faster results as compared to the other search engines. It follows the motto of "Don't be Evil" and has a mission of organizing the world's information and making it universally accessible. 1999 - AlltheWeb was launched but it closed on 2011. It was acquired by Yahoo! and now gets redirected to the Yahoo! home page. - Yandex was launched by Arkady Volozh Arkady Borkovsky Ilya Segalovich. It is the most popular search engine in Russia and one of the top 5 search engines of this world. 2000 - Baidu, the Chinese search engine was launched by Robin Li. Baidu is the most popular search engine in China and has over 20,000 employees working for it. It ranks in top 5 search engines of the world. 2009 - Bing was launched by Microsoft CEO Steve Balmer. It is one of the newest search engines in the market that is gaining popularity in the US. Mobile phones are growing at a tremendous rate and searches made on Smartphones may soon overtake the searches made on desktops. Getting your website ready for mobile is one of the best steps you can take for your business. Seo for mobile has become extremely important as all the leads and promotion that you did focussing on the desktop and laptop behavior of the user should now be focussed on the mobile behaviour of the audience. Here is mobile seo checklist to make optimizing your website for mobile even more easier. Create a separate version of mobile site with an easy to remember location. Detect mobile users automatically and redirect them to the mobile friendly version. Make your site light so that it opens up easily. Use more text and preferably no images. Have a mobile sitemap and submit it under Google Webmasters. Make sure to deliver local results instantly. People want instant answers. Prepare a list of mobile related keywords and optimize them w.r.t. your site. Make it easier for the user to navigate. Make sure to follow the rules of responsive web design. Prepare appropriate robots.txt for making secret content non indexable. 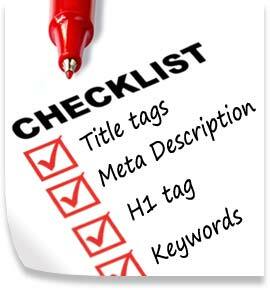 Have relevant and descriptive on page titles, descriptions and H1 tags. Hot Wording "Okay Google" - Now Search Google by Voice and Get Instant Answers! Something big and amazing is waiting to get launched. Time is not far away when you will be able to ask Google direct questions and it will respond to all your queries by providing audio answers instantly. This is known as "Voice Search" or "Hot Wording" and guys at Google (especially Amit Singhal) have come closer to make the Star trek computer a reality. Guys at Google call this audio search experience as "Hot Wording" where you may put up direct questions to Google using your Chrome browser in a similar manner as you are talking to a real person. As for example, you might want to know about the popular attractions in New York City, then you will provide a voice command to Google (instead of typing in the traditional search query) by saying "Okay Google, Show me the popular attractions in New York City". This voice query will work as an input string for Google and it will return a list of popular places in New York along with an audio reply saying " Here are popular places in New York City". Now, you might want to see some pictures of "Central Park" then you need to provide another voice command by saying "Okay Google show me some pictures of Central Park". Similarly, you may ask various questions like "How far is it from here?" (Note the words "it" and "here". Google knows that "it" has been used in context for Central Park" and here has been used for "current location".) Isn't it amazing? Have a look at this video where Google VP, Johanna Wright gives a demo of Hot Wording. Google Hot Wording uses natural language search technology and the information returned uses Knowledge Graph as it is a collection of interrelated real world entities. 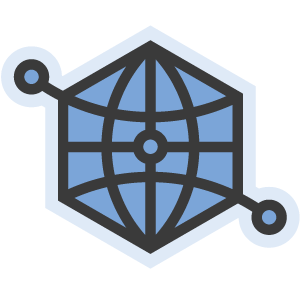 The Knowledge Graph helps the search engine giant to fetch accurate and relevant information after understanding the real context of the query. The function works on Chrome Browser and Chrome OS. How to Become a Google Top Contributor? 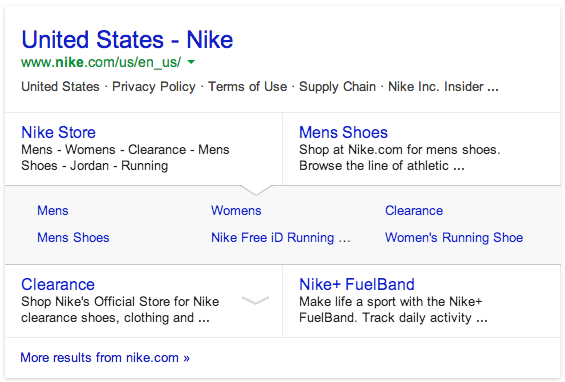 Google is in the process of returning a new form of sitelinks to the users. This new sitelink has two parts. The first part with a white background displays the main sitelinks and clicking on the main sitelinks will open the second part with a grey background area that will show the sub sitelinks under the main link. The original story has been published by Barry Schwartz at Seroundtable. SEO RESUME (CV) - How to Create a Professional SEO Resume? Provide an objective of what you are planning ahead in this industry. This should match your personal as well as professional preferences. Having an objective in your life helps in making the interviewer get an idea about your thoughts and how you see this industry from your personal point of view. Provide your personal statistics like your marital status, your date of birth, your nationality etc. Provide a summary of your educational qualification. Provide a summary of your work experience mentioning the period of working in various companies along with company profile and your professional work profile. Include some of your best seo projects, your individual role, the achievements you have made etc. Include a short summary of some extra curricular activities you might have participated in. Include a short summary of your personal skills. I love to take on challenges and grab on the available opportunities. I want to be a part of a company that can offer a platform for further developing my skills in the seo industry. · A very good listener. · An analytical mind with the ability to think clearly and logically. · Ability to work accurately and pay attention to details. · Reliable, responsible and hard working.